Congratulations, you survived one of the most grueling intellectual rites of passage in modern society: you have your Ph.D.! Now what? Well, I’d like to say that the world lays before you, screaming for access to your higher intellect and many talents. But the reality is now you are faced with one of the toughest tasks of all: getting a permanent job with an advanced degree in a crowded field. Now, there are lots of good choices here: Federal, State or local institutions, private companies, non-profits, but I am going to focus on what some consider — and I am admittingly biased — the brass ring of academic success: a tenure-track position at a college or university. It’s not that this is the end-all-be-all achievement of higher education. It’s not. It is just one of many choices after a Ph.D. but the one I choose to focus on here. In the end, it comes down to your long-term goals and what you want to accomplish in life. Before you jump on the Science want ads, spend some time thinking about what you really want in your life. Tenure-track positions at colleges and universities generally revolve around a mix of teaching and research so you need to decide where you land on that continuum. Percentage of institution types within U.S. higher education (based on data from the Carnegie Classification of Institutions of Higher Education, 2010). At one end, community colleges (CCs), which mostly offer Associate-level degrees, focus on teaching and won’t offer much time to build a research program given the high demands on your time, which generally requires 4-5 courses per term (quarters or semesters). Despite that load, some people are able to conduct research in CCs but it’s generally not what you’re paid to you unless you make it part of your teaching duties (e.g., integrated teaching-research experiences). 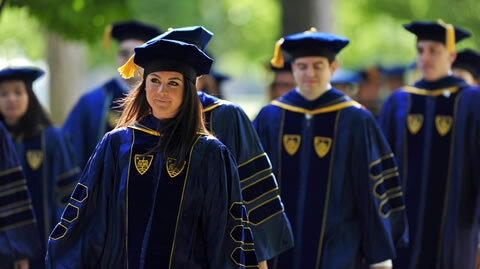 Baccalaureate universities, so-called liberal arts-based institutions, are focused primarily on undergraduate students, so expect a lot of teaching, but research is required at some level and some faculty are quite productive, especially if research is conducted with students as part of class projects, special topics courses, etc. These institutions typically require 2-3 courses per term plus varying degrees of accomplishments in scholarship (generally grants, publications, service, and pedagogy). Comprehensive, or MS-level degree institutions, are generally similar to Baccalaureate universities but with more time allocated to research. However, teaching is still the primary concern. Student learn by conducting research at Humoldt State University. Finally, there’s the R1-R3, or Doctoral Universities R1 = highest research activity; R3 = moderate). They are primarily focused on research and lots of it, but teaching is also important to varying degrees. In all of these choices “service” is also a key component, which means serving on committees or advisory boards at the college, university, local, state, national or international level. Ultimately it is excellence, or at least competence, in all three of these areas that will determine the success of your career in academics. Standards vary widely and its one of many things you should learn about before accepting a job offer at a particular institution. In the end, there aren’t many easy choices here: each is challenging in its own way. In general, teaching is more straightforward, predictable, and easier to plan your life around but it can also be grueling and relentless but also very rewarding. Research has a larger random element due to its dependence on peer-review of grants, publications, actually at just about every level. It is also very satisfying to be generating new knowledge and contributing to the research agenda at many levels. But if your good at research, once you gain momentum, it can be very satisfying. I personally have had positions at liberal arts, comprehensive, and research universities and have found that all have different strengths, challenges, and rewards (see Living Mr. Holland’s Opus: My Life as a College Professor). Because you’re about to jump into an extremely competitive environment, it is really, really important to think about the choices before you. Most likely you’ve had experiences in your graduate career that have exposed you to the pluses and minuses of teaching and research and you know what makes you happy and what you’re good at. Be honest: not everyone is cut out to be an amazing teacher or world-class researcher. If you’re good at both, great, but you need to know where to aim on the teaching-research continuum. The worst thing you can do is take a job that doesn’t fit which can end up with a sudden move or denial of tenure down the road, This step is definitely worth the extra thought. Whatever you do don’t just take the first job that comes along. You’ve worked very hard for your degree and finding the right position takes time. Be patient. It can take years. Waiting is probably the hardest thing you can do but have confidence that you are unique and the right job is waiting for you. As a newly minted Ph.D., after a one-year post-doc, I applied to 19 positions before I made it to my first long list, then I personally interviewed for the next two positions before I was finally offered a job. Since then I have applied for an additional six jobs, interviewed at four, and had three job offers. Maybe I’m getting better but it could be that experience and time to getting a job offer can vary tremendously (see 112 applications, 17 interviews, 3 offers). As I mentioned in my post, how to become a marine biologist: don’t give up. Timing is everything. Once you know what you want, start looking for position advertisements in Science, Nature, the Chronicle of Higher Education, or whatever sources you can find including discipline-, ethnic- and race-specific listservs and websites. If it fits your criteria for balance, apply. The more experience you get, the better your applications will become. I personally don’t waste my (or their) time on applying for a job I would never consider accepting but that is a personal and ethical choice. Some people apply to everything. It is ok (and good practice) to call the chair of the search committee and ask questions. The more you know, the better your application will be as you will be able to address specific issues they are looking for in your application. Although the chair may not answer all your questions you should try, but don’t be overly intrusive. What are they looking for? What classes are they looking to have taught? What area of research would complement existing strengths? Are they adding a new area? What’s it like working there? Who’s on the search committee? All of these questions can help you write your application letter and prepare for an eventual interview. DO NOT ask about salary, start-up, or anything that can be considered presumptuous at this stage in the process. Some questions are best left until after you get an official job offer. Pay attention to the job application: the search committee (the one that will recommend you for the position, or not) has spent time writing it, so take it seriously. Think of your letter as a summary of why you should get the position with the details in your CV. The truth is this letter can make or break your chances on getting to the next level. The idea is to make it easy for them to see that you are highly qualified for the position. So structure it around what they are looking for: express interest and state why you are a good fit, then paragraph by paragraph address your qualifications in order of their importance. If it’s a teaching job, start with that and why you’re the best teacher on the planet, or at least describe your experiences and how you fit in with what they want. Then research, then whatever else is in the job ad. Conclude with a summary of your qualifications and restate your interest in the position. The letter should be 2-3 pages max. Absolutely make sure to address the minimum and desired qualifications in all of your application material (including research and teaching statements) but particularly in your application letter. Ther should be no typos, grammatical errors, or anything the committee can use to justify cutting you. Having served on 20 search committees (and chaired most of them) it is tedious reviewing applications for a position where the applicant didn’t take the time to address their qualifications for the position; surprisingly, the majority of applicants don’t and are quickly eliminated. So make it easy on us and you’ll have a good chance of making it to the next step: the long list. If you just zing in the letter you used for the last position, chances are you’ll be eliminated. Your CV fills in the details of your education, accomplishments, and experiences and should be customized for each position. Based on the duties of the position, place the most important material up front. If it’s a research position, quickly transition from your education and work experience to your grants, publications, and anything else relative to conducting research (advisory boards, review panels, etc.) then move onto the next most important category. In reality, this just means reorganized your CV for each position you apply for so that organizationally your CV matches the logic of your application letter. Again, make it easy for the committee to see your strengths relative to the position requirements. It’s worth the extra effort. Preparation is key to getting a job offer. If you’ve made it to the long- or short-list then you’re competitive and have a decent shot at the position. Don’t blow it by not adequately preparing. This involves several steps. First, learn about the university, its vision and mission, and any current issues it may be dealing with. Then focus on the college, the department and the faculty. If you know who’s on the search committee, research each person, their interests, and what papers they have published recently. Read a few of their key papers and be ready to discuss them. Importantly, try to imagine the type of issues they might focus on and the specific questions they might ask. When you’re meeting with someone you’ll have something to talk about and show you’ve done your homework. I make a list of as many possible questions I can think of and write out my responses. These include both standard questions (Why do you want to come here? Why do you value diversity? What’s your teaching style, preferred courses? research interests and experience? long-term plans?) but also specific questions each committee member may ask based on their individual backgrounds. Once you get a schedule for your interview then also do that for everyone you will be meeting with. It sounds like a lot of work, and it is. Eventually, it all boils down to how bad you want the position. It is obvious in an interview who has done their homework and who hasn’t. If it’s a phone- or video-interview you’ll be well prepared for anything they may throw at you. Some committees may send questions in advance but most won’t, so just answer things the best you can, be relaxed, take your time, and make good eye contact (if online). Your answers should be brief (a minute or two), not overly long or short and should stick to the topic. In the end, you’ll usually have time to ask your own questions. Make sure you have several ready that illustrate both your knowledge of the position and will provide important details about the job. Again, this is not the place to ask about salary, start-up or other issues that are best left until after you get an offer. At all stages, but especially if you get invited to a personal interview, you need to be on your best behavior. Be professional in everything you do. Dress appropriately (ask the committee chair about protocol if you’re not sure), scope out who you will be talking with and know something about each person before you go, be prepared with questions but be a great listener. Study a map of the campus. This is a trial run of what it might be like to work at this institution so do your best to convince them you are the right person for the position. At the same time ask intelligent questions that show you have high standards and are well informed. Again, save potentially polarizing questions like salary, start-up, what specific classes you’ll be teaching, etc. until you’re offered the position. There may be some hidden agendas. There is nothing worse than talking to an interviewee that has not done his/her homework. If you want the job, ACT like it in all aspects with everyone you meet. The interview process can be a grueling marathon lasting several days so in some respects it is an endurance contest. Never let down your guard, both formally on campus, and informally during meals or at potlucks. The whole idea of the latter is to get you to relax and assess the important, but unwritten, collegiality component of the position. Sure, they want your scientific prowess and vast experience but they also want you to fit in with their department and get along as a fellow scientist. In many, perhaps most cases, they already know your background and qualifications, so collegiality can be a big deal. My advice is to just be yourself. But not overdo it. Avoid questions about your personal life, significant others, etc. at your discretion. Although many of these questions are technically off limits, some people will ask them anyway, unfortunately, especially of woman. So be guarded and politely change the subject if the interview strays into an area where you don’t feel comfortable. Despite how much you prepare, there will be plenty of unknowns where you’ll have to wing it, but the more you prepare the better you’ll be ready and the better the impression you’ll leave behind. Once you make the short list and you’re competing with just 2-3 other people, it can make a huge difference. The culminating moment of your interview will often be your research talk, and in some cases a research and teaching talk. Here it is: your moment to shine, to show your stuff, to give the talk of our life. This is the moment where the search committee members often make their decisions about who to choose, so give it everything you’ve got. You want to be very well organized, clear, and passionate about your work. Be creative and engage the audience by asking questions or using interactive media. Faculty know this is your moment to showcase your work, so if you’ re not blowing them away here, you certainly won’t once you’re hired. Cardinal sins to avoid are: making mistakes, going over time, and giving an unorganized and confusing talk. If you use any video or sound, make sure it all works on the equipment in the room you are assigned to give your seminar to avoid any tech problems. I always bring my own laptop, just in case, and test it out prior to the seminar or lecture. Same with a pointer and slide clicker. The last thing you need is to be flustered right before your seminar starts and/or to suffer delays or bad media during your presentation. Although it may not be your fault, it will reflect badly on you. This is not the time to be testing fancy videos or cool graphics. Stick with the tried and true, relax, and give a clear and well-organized talk and it will be appreciated. Ok, you survived the interview and have patiently waiting for weeks and months as the search committee has deliberated on your fate. Then you get a call, or an e-mail offered you the position. What do you do next? Indeed, you’ve worked your whole life for this moment so it’s tempting to just say “Yes!” without condition. But the truth is, this is a key moment in your career that may determine your future success. For my first position, I pretty much took what they offered me; I was just happy to get a job. But as the years went by I came to realize I had not taken advantage of a golden opportunity. Although the Dean/Chair may want you, they want you at the lowest price possible. Their motivation is to keep costs down. From your perspective, you want to get the highest salary possible because once you’re in the system the reward systems are often meager; hence you starting salary is likely the biggest opportunity you will have to achieve a high salary. But there are limits, so do your homework, know what is possible and what comparative salaries are like elsewhere. Take cost-of-living into perspective as well as opportunities for your spouse to get a job in the local area. The same goes for start-up funds. This is your one chance to get funding for that key piece of equipment you need to get your lab started. You should negotiate your lab space, any renovations required, and funds to get your lab up and running. Also, think about grad student or tech support for the first few years. Salary and start-up can be played off against each other, so if you don’t get the salary you want, push for more one-time start-up funds. Or vice-versa. Other things you can negotiate are moving expenses, future travel funds and/or grad/tech support. It is easier for administrators to make future commitments relative to current commitments, but whatever you do get it in writing in your offer letter. The letter should include your salary, start-up amount and the time period over which they can be spent (commonly 2-4 years), teaching load, specific courses you will teach (if you want), and any credit towards tenure and promotion along with the details (or a link to) their T-P process. If things don’t work out and you’re not offered the job, don’t give up. It can take years to get the right position and as daunting as that may seem it will be worthwhile if you end up in a great job. Plus, the more you interview the better you will get. After all these years of hard work, the worst thing you can do is accept a sub-optimal position. Of course, you know your strengths and weaknesses better than anyone, so be realistic, but selective. The reality is the only way you will not become a marine biologist is to give up. So hang in there because someone is waiting for your specific talents. Brian- Great job describing a topic that does not receive enough attention. I wish I had had this advice as I was getting ready to graduate. Thanks for thinking this through and writing to help the next generation of great marine scientists.